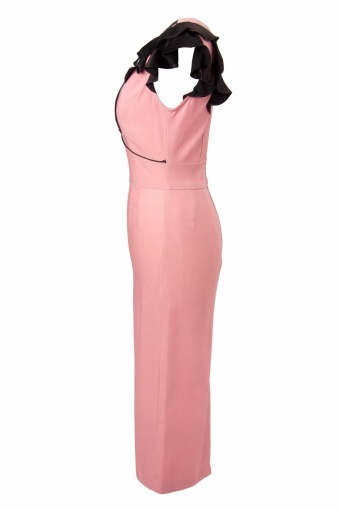 Limited collection for the very last time exclusively available at TopVintage: The 40s Vogue Glamour Blush Dress Pink by Stop Staring! It is sure to turn some heads! It is stretchy and hugs all of your curves. The black satin crepe bias cut ruffle trim shows off the plunging neckline in a subtle yet alluring way! 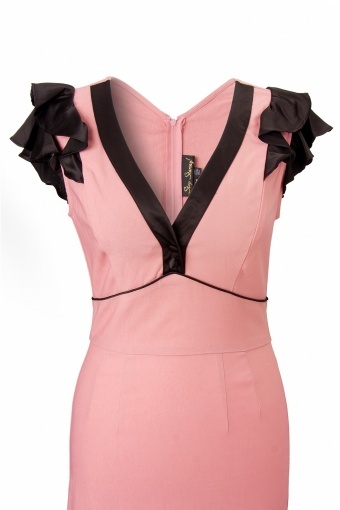 The fun and flirty ruffles are a nice accent on this Blush pink dress. The dress is form fitting throughout the bodice, midriff, and pencil skirt. The dress is very slimming and hangs below the knee height,and a kickpleat in back, making this the ultimate in Vogue Fashion! This dress is perfect for hot summer nights, a romantic dinner, or a day brunch with friends! *Update on fabric in photo. Fabric in photo is no longer available, the jacquard millenium fabric. It no longer has the line texture. It is now a flat stretch millenium fabric, as on the product images. The colour & stretch quality are the same.